If you want to understand the science behind the world’s most serious environmental and ecological challenges, this is the course for you. You learn from experts influencing global debates. Topics include sustainable development, endangered species conservation and animal behaviour. 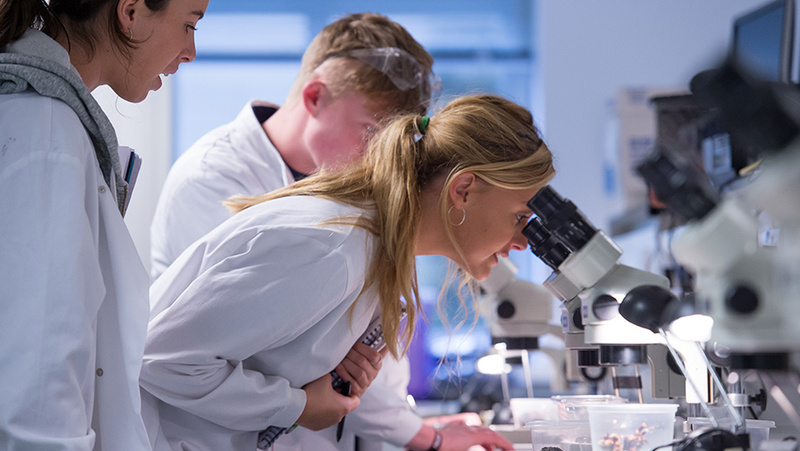 This course includes an integrated Masters year, allowing you to develop advanced research skills and work with one of our research groups. Outside the classroom, you have the opportunity to explore the South Downs National Park on local field trips and to go on trips to Wales, Devon, Yorkshire, Portugal, Southern Africa, the Red Sea and Ecuador. This – alongside modules on research methods and technologies such as Geographical Information Systems – gives you real-world research experience before you graduate. A-levels must include at least one from Biology, Chemistry, Environmental Science or Physics. Where you are taking a science subject that has the separate science practical assessment, the University would normally expect a pass. If students are not able to take the science practical assessment, applications will be considered on a case-by-case basis. A-levels or Cambridge Pre-Us must include at least one from Biology, Chemistry, Environmental Science or Physics. Where you are taking a science subject that has the separate science practical assessment, the University would normally expect a pass. If students are not able to take the science practical assessment, applications will be considered on a case-by-case basis. A-levels must include at least one from Biology, Chemistry, Environmental Science or Physics. You will also normally need to pass the separate science practical assessment in at least one of the science subjects. If you are not able to take the science practical assessment, applications will be considered on a case-by-case basis. A-levels must include at least one science subject from Biology, Chemistry, Environmental Science or Physics. French Baccalauréat with overall final result of at least 15/20 to 14/20. Highers will need to include at least one from Biology, Chemistry or Physics with a grade of H1. Fullstandigt Slutbetyg/Högskoleförberedande Examen with a total of 2,500 credits to include A and B grades in the majority of subjects and to include a grade B in either Biology, Chemistry or Physics. This course has mandatory Year 2 field courses, which together cost £200. field research assistant, Locus Agricultural Solutions. other roles in ecological and related sciences. You are supported through careers-focused events – including drop-in sessions, talks and workshops – tailored to your subject. Access to careers support from Sussex continues after you’ve graduated.